At Augustana, we make an effort, in classes, in Chapel and in our conversations with each other, to remember the suffering and death of the ultimate servant, Jesus Christ. We are reminded time and time again of this special gift to humankind and we celebrate the power God gives us to share our gifts in ways that connect us to others through word, thought and deed. In this issue of Go Viking, we recognize those who are using their God-given gifts to stir the hearts and empower the minds of others through the performing, visual and literary arts — and in doing so, are building the connections our world needs to develop ideas, find solutions and experience joy. These special people are using their gifts to offer us inspiration and wonder through visual works of art; entertain our minds and our senses on movie screens; and captivate our hearts through music and song. By living out their God-given talents, they are helping to weave the fabric of our futures. When we discover our connection to art, or books, or film or music, our perspectives grow and the shape of our thoughts change. You’ll meet artist Kiel Mutschelknaus, class of 2007, who is exploring ways to create art using technology; professional opera singer Lindsay Ammann, class of 2006, who is using her gifts to bring joy to others; and rising filmmaker Andrew Kightlinger, class of 2008, whose passion for storytelling comes alive on the screen. We’ll introduce you to Augustana students Ali Goers and Brad Ostendorf, two of many students who’ve told us they’re interested in sharing their Augustana experiences with prospective students to help “spread the word” about all the good things that happen here. And, finally, you’ll meet the newest member of our Augustana family, Jerry Olszewski, the new Viking football coach who will use his gifts to impact the lives of young men, helping them become the best student-athletes they can be. We hope you enjoy this collection of stories about a great group of people we feel blessed to be connected to. Since 1860, the stories of renowned teachers, nurses, lawyers, writers, entrepreneurs, doctors, artists and researchers have begun at Augustana. Soon, you’ll begin the next chapter in your life. Where do you want your story to take you? 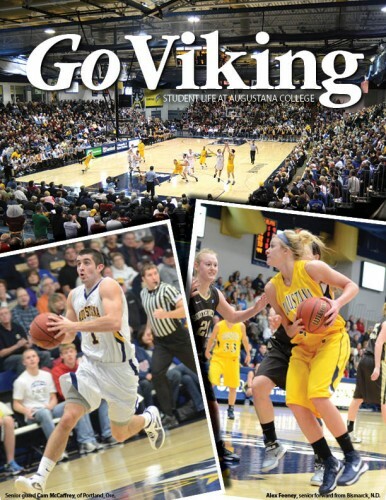 At Augustana, you’ll be encouraged to Go Viking. That means we’ll be here to help you explore and discover the bold concepts and important ideas you’ll need to write your life story and create a better tomorrow. I encourage you to visit us to learn more about what life is like at this great place we call Augustana. When you’re on campus, stop in for a visit — I’m looking forward to talking with you!